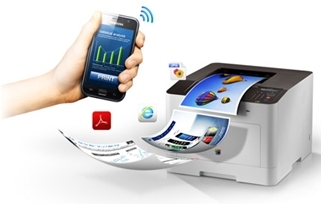 What is Samsung Mobile Print? Samsung has created a mobile print tool where Printing photos, web pages, PDF files and even Microsoft Office documents such Excel spreadsheets and PowerPoint presentations; from your mobile devices is now a simple task. Whether it is an Android, iOS or Windows Phone based smart phone or tablet PC. Simply Install the app, select the content and then wirelessly print it. It could not be easier. And with a diverse range in print options such as original size, paper orientation, size, number of copies, color or mono and so much more, your printing operation is now a lot more intelligent and far more capable. It also supports printing and scanning images from social networking sites and other internet sources directly. This app is pre-installed in many Samsung smartphones but in case you cant find it in your phone, go to Play Store to install it as any other app.